For the online Student Guide (SG) click here. 2/16/16 - For Bill Nye's video on Motion click here. To play Coaster Creator click here. Read Lesson 8 in the Student Guide, pages 72 - 75. To access the online Student Guide, click the link above, then click Lesson 8. Stephanie uses a force of 12 Newtons to lift a book 1 meter. How much work did she do? Kevin gets a flat tire on his bike just before he gets home. Using a force of 20 Newtons, he pushes his bike a distance of 40 meters home. How much work did he do? Petunia and her friends are having a tug-of-war contest. Petunia's team manages to pull with a force of 150 Newtons and moves the opposing team 4 meters. How much work did Petunia's team do? To go to Study Jams - Energy and Matter (Kinetic and Potential) click here. Interactive on Newton's 1st Law of Motion (Law of Inertia) click here. To play with circuits click here. To learn about friction click here. To play the friction game click here. Batteries are devices that convert stored chemical energy into useful electrical energy. How a battery works: Batteries are all about chemical reactions. Batteries work because chemical reactions inside the battery cause electrons to be pushed and pulled around a circuit. When all the chemicals in the battery have been used up then the battery is dead. an electrolyte that separates the 2 electrodes. 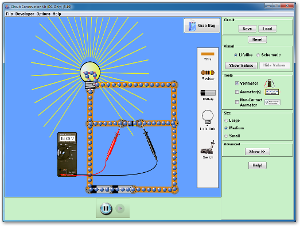 For more practice with building circuits click here. For practice with weights and motion click here. 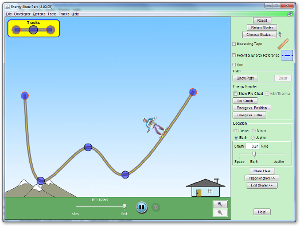 Play with Kinetic and Potential Energy with this fun roller coaster simulator. Click the picture on the left to download. You need Java installed to run the program. Once you are in the program there is a menu of options on the right side. Choose your skater (each skater has a different mass). Uncheck the box for Measuring Tape. Check the box for Potential energy reference line. Check or uncheck Grid, it's up to you. Click Bar Graph. The bar graph is the most useful graph. You can drag it around the screen to move it out of your way, but leave it open. Bar Graph shows you how the skater's Potential and Kinetic energy change based on speed and height as the skater moves along the track. The total energy bar shows that the total energy does not change. Energy is simply converted back and forth between potential and kinetic. this is called Conservation of Energy. Energy can not be created or destroyed, it just moves from place to place and changes forms. If you don't do anything else, the skater will go back and forth forever. That is not the real world, we're missing a really important force: FRICTION! Go ahead and turn friction on (how much friction is up to you). Because of friction, energy will constantly be lost as it gets transformed into heat. Eventually your skater will slow down and stop. Build your own track! Drag the blue points to move the track around. Add more track pieces. Zoom in/out. Slow down or speed up the simulation. Play! You can't break anything! Change the mass of your skater. Change the force of friction. Change what planet you're on (this changes the gravitational force). Can you make a loop?